Ford Think Drive Shaft Replacements. Convert from a bad U-Joint design to Constant Velocity (C/V) Half Shafts. C/V shafts are much better than U-Joints. Sold as a set of 2. No modifications required. 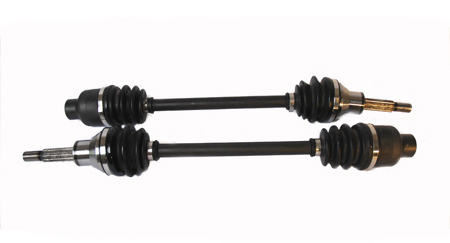 This is a direct replacement for the rear U-Joint driveshafts. Work great, solid fit. Good value. Overall quality built part, and importantly the cv boots have a thick durable material. I looked around online for a used eom drive shaft, close to the same price as this a/m fix for both sides. The think shafts are a known weak point, and this resolve a looming u joint snap. Pain to take off the old drive shaft unless you have the right tools, we ended using a slide hammer with vice grips at the end, and plenty of penetrating oil. The part fits perfect and this was cheaper than getting my one old axle fixed!!! GREAT BUY!! I cant believe what a difference these axles make! Took me some time to pull out the old ones, but it was well worth it!